"What is really important here, is that the gecko always has clean feet", says Hendrik Hölscher, material researcher at the Karlsruhe Institute of Technology (KIT). "For if there is a layer of dust or dirt on the fine hairs, the adhesive force does not work anymore, just like with a dirty sticky tape." 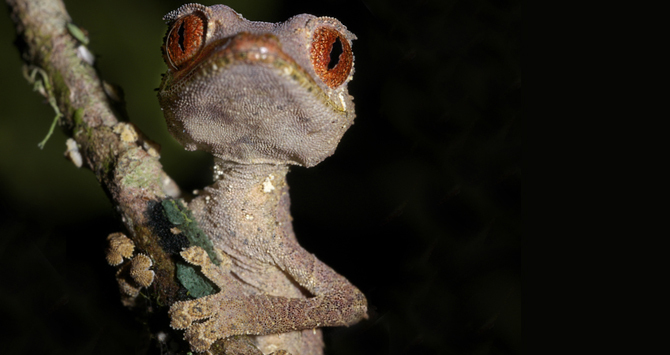 Geckos remove dust and dirt by rubbing it off their soles. So far, the structural characteristics of this self-cleaning are based on remained unknown. Hendrik Hölscher and his colleague Michael Röhrig, together with scientists from the Carnegie Mellon University in Pittsburgh, researched the question of how an artificial adhesive tape must be constructed to have a self-cleaning effect that is equal to that of a gecko's foot. The researchers designed an adhesive tape with elastic, artificial microhairs. Tiny glass spheres acted as dirt particles. Using a special apparatus, the artificial adhesive tape was pressed onto the glass spheres. Then the adhesive force was measured after soiling and subsequent cleaning. The researchers simulated the cleaning process by pushing the tape sideways across a glass surface. "Since we assumed that the size of the fine hairs could play a role in the self-cleaning process, we have investigated various sizes of microhairs and glass spheres", explains Hölscher. "When the diameter of the glass spheres was larger than the diameter of the microhairs, the spheres were brushed off and the adhesive tape regained almost 100 per cent of its original adhesive force after about ten cleaning moves."